Nominations for both the UDP and the PUP's Belize Rural South Standard Bearers, Manuel Heredia and Patty Arceo were held on Tuesday, August 11th at the San Pedro Town Hall. Supporters for Manuel Heredia marched to the Town Hall from the UDP office at about 10:30 a.m. PUP supporters marched around town at 1:30 before assembling at the Town Hall. Both candidates were nominated without any objections. In an effort to familiarize the people of Belize Rural South with the UDP and PUP Standard Bearers, the San Pedro Sun interviewed them on Tuesday. U.D.P. 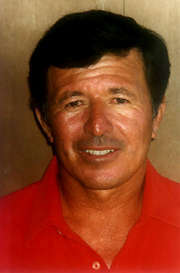 Standard Bearer Manuel Heredia Jr., J.P.
Mayor of San Pedro Town 1995-1997 and 18 years of involvement in the town board. Why should the people elect you? First, I am very impartial when it comes to politics and serving the people. We should all serve everybody equally. That is what I have done and want to continue doing - to serve everybody the same way. I have the experience to serve the people. I have worked with the Belize Fishermen's Cooperative, The Fisheries Advisory Board and a member of the trustee of Hol Chan. If elected, what four important issues will you address first? The tourism industry is the most important. Then I think that the second is the fishing industry. Next to that will be education and the last one would be sports and streets. Does your party have a manifesto and what is the most important issue your party will be focusing on? Our manifest will be out on August 12th. The economy will be the most important issue that the UDP will address. In your electoral division, what is the most pressing issue that must be addressed? The promotion of the tourism industry is of high importance, not only for our constituency, but for the whole country of Belize. With elections being a few days away, what would you like to tell the people in your division? Let us be peaceful for this election. Let the people go to the polling stations and exercise their right to vote without being harassed. So on election day, let the people make their choice. P.U.P. Standard Bearer Patty Arceo J.P.
Name: Anna Patricia "Patty" Arceo, J.P. 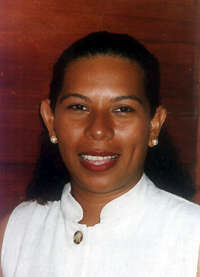 The Belize Woman's Group, Women's Political Caucus, Belize Youth Movement, Chairlady of the Ambergris Marketing Committee, The San Pedro Traffic Committee, The San Pedro Youth Group and Planning Committee and Deputy Mayor of San Pedro 1991-1994. Belize Rural South needs the proper development of social services, it needs to promote the tourism industry and to protect our environment. There is the need to upgrade the standard of education and expand the fishing industry, while at the same time placing the basic infrastructure (Water/sewage, electricity, streets and distribution of land). I have the ability to provide this to the people. My main priority is tourism and the fishing industry, followed by land distribution, education and youths (sports), and infrastructure. Yes, the People's United Party unveiled its manifesto on Wednesday, August 5th. It was the compilation of all the national people's assembly. There are many issues which are very important and that we want to address. There is the growth of the country's economy, production of more jobs, and less taxes; the education revolution, land and natural resources, house ownership, political reform, our youth and culture, agriculture, national security, proper health system, tourism, the empowerment of Belizean women, public service, foreign affairs, rights and freedom (setting Belize free). I would say that it is the marketing and promotion of tourism. We need to promote and market tourism, especially in the international markets. More visitors means more jobs, and that means more growth in our economy. I also think that land distribution is a very important issue. There is the need for the proper distribution of good and solid land to our people. The subdivision of lots must and will carry, under the People's United Party government, good streets, electricity and water systems to serve the needs of the people. We will ensure that we have a land's department where people can go on their own timing to apply for lots and apply for a lease or property title. It is every Belizean's right (from Corozal to Toledo) to have direct access to a lot. For five years we have been living under a government that has neglected and humiliated us with broken promises for freedom, free housing and lots, free daycare and free land. For five years, our cost of living has been very high. It is time to look into the 21st century, into a new horizon, into a new beginning. The People's United Party will bring economic growth (through the tourism, agriculture and fishing industries) social justice, protection of the environment, reduction of taxes, promotion of youth, sports and our culture. Voters of Belize Rural South, on August 27th, your vote means the betterment of our country, our family and our community. Your vote is your future. I hereby ask you to join me and the People's United Party to a better future. Vote PUP.